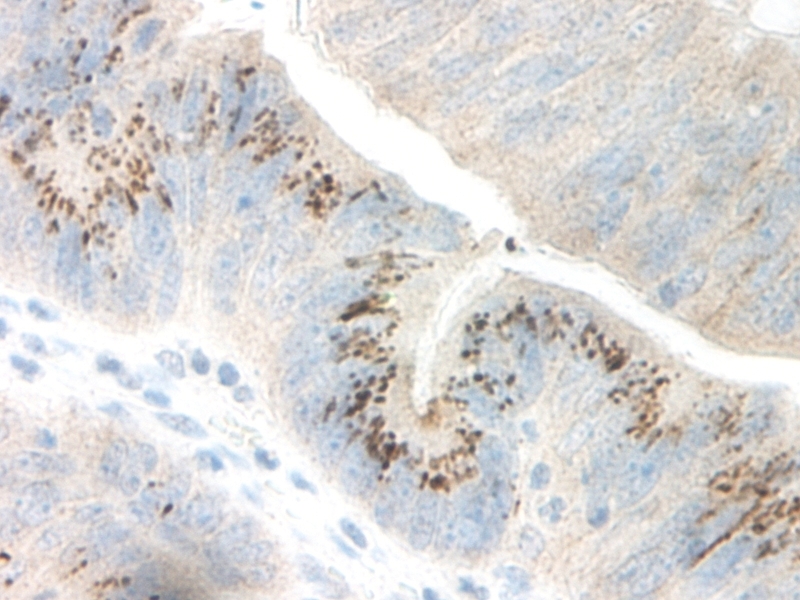 Staining of formalin fixed, paraffin embedded human colorectal adenocarcinoma with Rabbit anti Human GRO gamma (AHP774). 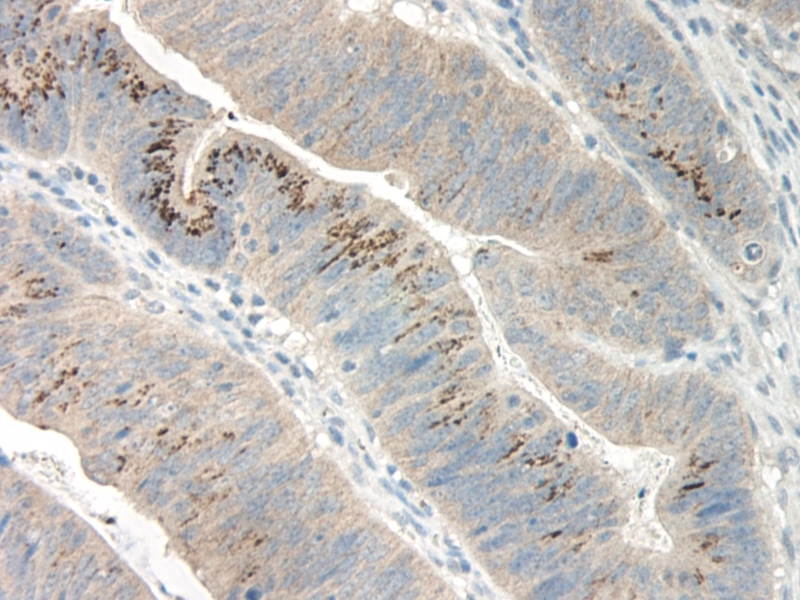 Rabbit anti Human GRO gamma antibody recognizes human GRO-gamma, also known as CXCL3, Growth-regulated protein gamma, GRO-gamma(1-73), Macrophage inflammatory protein 2-beta or MIP2-beta. GRO gamma is a ~7.9 kDa CXC chemokine and one of three closely related, but distinct GRO gene products, which act as chemoattractants and activators of neutrophils and basophils. Like GRO-alpha (CXCL1) and GRO-beta (CXCL2), GRO-gamma contains the ELR-motif (N-Terminal Glu-Leu-Arg amino acid sequence) and signals through the CXCR1 and CXCR2 receptors, though studies have shown a difference in the potency and receptor binding affinity of these three proteins (Wuyts et al. 1999). Antisera to human GRO-gamma were raised by repeated immunisations of rabbits with highly purified antigen. Purified IgG prepared by affinity chromatography. 1This product requires antigen retrieval using heat treatment prior to staining of paraffin sections. Sodium citrate buffer pH 6.0 is recommended for this purpose. Kogan-sakin, I. et al. (2009) Prostate stromal cells produce CXCL-1, CXCL-2, CXCL-3 and IL-8 in response to epithelia-secreted IL-1. Haskill, S. et al. (1990) Identification of three related human GRO genes encoding cytokine functions. Proc Natl Acad Sci U S A. 87 (19): 7732-6. Geiser, T. et al. (1993) The interleukin-8-related chemotactic cytokines GRO alpha, GRO beta, and GRO gamma activate human neutrophil and basophil leukocytes. J Biol Chem. 268 (21): 15419-24.